I saw The Lord of the Rings: The Fellowship of the Ring when I was probably six years old, and it's fair to say, I wasn't a very good movie watcher back in those days. Because I didn't remember any of it. Which probably has something to do with the fact that it was way over my head when I was just a young six year old. 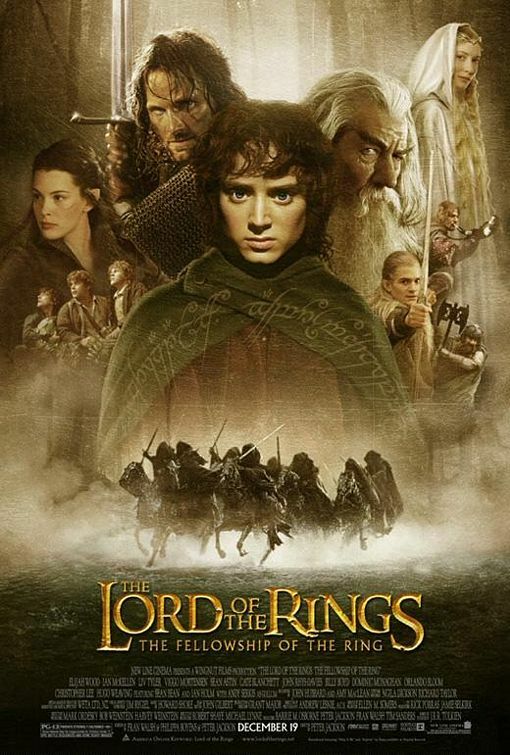 But now, and I think I'm crazy for doing it, I'm going through all of The Lord of the Rings to see what I have been missing, all in a matter of three days. That's probably not as crazy as the people who watch them all at once. In a small village, a hobbit named Frodo (Elijah Wood) is given an ancient Ring that was thought to have been lost but is found. The Ring in fact belonged to the Dark Lord Sauron, and Frodo must embark on an epic journey across the Middle-Earth to the Cracks of Doom to destroy it. In this quest, Frodo is not only hoping to destroy the Ring, he is also hoping to end the Dark Lord's reign. I have never read the books, nor do I want to (because, despite what teachers think, I dislike reading immensely). But there is just something so magical about this film which sets it apart from other adaptions of classic books. Fans of the book would have obviously been hoping for a lot, and I'm pretty sure Peter Jackson delivered to their high expectations. That's another thing: Peter Jackson, or should I say Sir Peter Jackson, was absolutely the right person to handle the mammoth task. Even if before this, he only directed gorey slasher films and Heavenly Creatures. For people who think that New Zealanders aren't entirely capable of making it big in Hollywood, that little guy from Pukerua Bay (one of the few places in the North Island where I haven't been) made some of the best films the world has ever seen. But it's a bit too early to be judging the greatness of one great New Zealander, isn't it? I've still gotta watch the rest of the series. What do I have to say about The Fellowship of the Ring? A solid start to what I'm sure is something great. And I could totally tell it was filmed in New Zealand (Americans, are you jealous? You should be.) It has some amazing special effects...and is more 'epic' than Avatar could ever be. I don't really know what more to say, it was pretty grand, even if some points did induce some boredom. But that's just me. Fine first installment. Movies don't really get much better than this. Yeah I recently tried to watch all three in one day. I have the special extended versions so they each are about 45 minutes longer than the regular versions. It took me 2 1/2 days to watch them. Glad you went back and started rewatching them. They are three of my favorite movies.